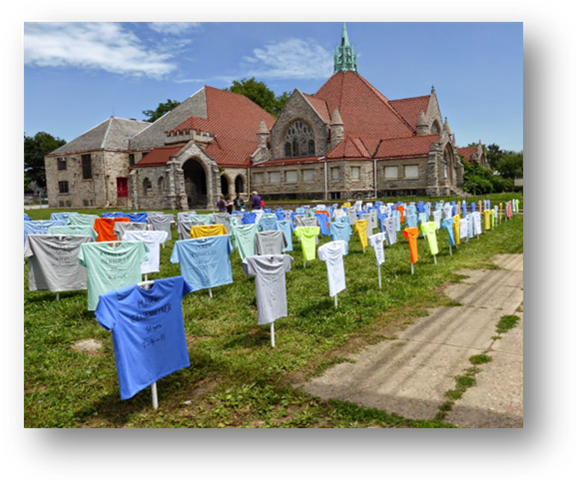 It’s a matter of Life and Death – News from Chester Eastside, Inc.
A display of T-shirts representing Delaware County residents killed over the past five years. Last year Chester set a record of a kind it doesn’t like to set: 30 violent deaths, most of which involved guns killing young men of color. That in a year when the homicide rate was down in most parts of the country. Now Chester Eastside, Inc., has joined others in the community seeking to stop the violence. Its Board unanimously passed a resolution to that effect at its April meeting, putting the agency squarely on the side of the peacemakers. Overall, the statistics say that the number other serious crimes is down from what it was in Chester. So there are signs of progress. Which doesn’t take away from the need for action when it comes to gun violence. In a strongly-worded resolution that appears at the end of this article, the Chester Eastside Board committed itself to join the fight for more effective gun control and include content on the subject in its programs. Such efforts are not new to Chester Eastside. Some years ago it gave birth to and continues to support the Peace Leadership and Arts Summer Camp that helps young people find alternative ways to settle their differences and work for a more peaceful society. It’s not only the risk of bodily harm that is at stake. Children exposed to the trauma of having family members die violently and parents worried about their children’s safety are also hurt by the threat of gun violence. Chester Eastside is hoping more churches and community organizations will also join in the effort to stop the violence. Be it further resolved that Chester Eastside make known the above initiatives to its stakeholders and the general public in order to encourage their support.